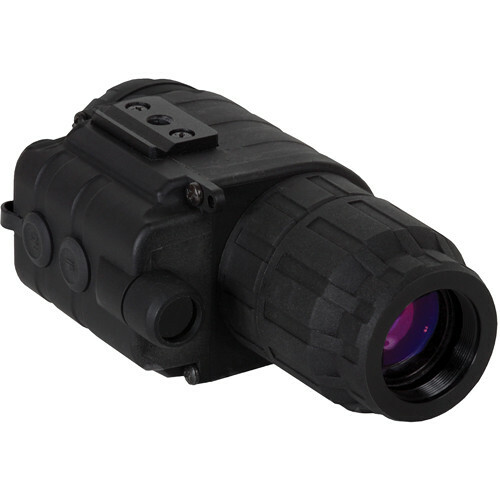 The Monocular Ghost Hunter 1x24 Night Vision Goggle Kit from Sightmark provides an optimum surveillance solution for prolonged durations via an included head mount assembly. Offering hands-free operation, the head-mount assembly allows you to flip up the monocular when not in use. A magnification of 1x and an objective lens diameter of 24mm are provided by the Ghost Hunter 1x24 Night Vision Goggle Kit. An integrated IR illuminator allows you to comfortably view your target, even in low light conditions. An auto shut-off feature switches off the IR illuminator when the monocular is exposed to a bright source of light, thus saving valuable battery power. Constructed from durable plastic, the Ghost Hunter 1x24 Night Vision Goggle Kit sustains rugged use. Box Dimensions (LxWxH) 9.4 x 8.2 x 4.0"